Earlier this year, I wrote a post about how to tackle a huge looming project. Back in the summer of 2012 I was dealing with the biggest professional project of my life – studying for the CPA Exam. 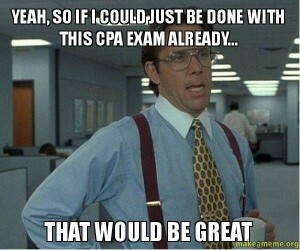 I’m happy to say that I now have my CPA license because I learned how to pass the CPA exam on the first try. Today I’m going to show you what I did. I read a ton about the CPA Exam itself before I started and while I was in the middle of it (and not at all after I was done). You have got to learn everything you can about it in order to pass. It’s important to learn from both the official source, but also from blogs and forums where people who are also taking the exam are chatting.